Abhidharma (Sanskrit; Pāli Abhidhamma) is a category of Buddhist scriptures that attempts to use Buddhist teachings to create a systematic, abstract description of all worldly phenomena. The Abhidharma represents a generalization and reorganization of the doctrines presented piecemeal in the narrative sutra tradition. 1) abhi— higher or special + dharma— teaching, philosophy, thus making Abhidharma the ‘higher teachings’, or 2) abhi — about + dharma of the teaching, translating it instead as ‘about the teaching’ or even ‘meta-teaching’. Scholars generally believe that the Abhidharma emerged after the time of the Buddha, as the growth of monastic centers and support for the Buddhist sangha provided the resources and expertise necessary to systematically analyze the early teachings. However, some scholars believe that rather than being wholly created by later thinkers, the Abhidharma represents an expansion of an early set of mnemonic lists and categories that were employed by early Buddhists to preserve the oral tradition. of seven books. The Theravada Abhidharma, the Abhidhamma Pitaka (discussed below), is preserved in Pāli, while the Sarvastivadin Abhidharma is preserved only in Chinese- the (likely Sanskrit) original texts having been lost. A small number of other Abhidharma texts of unknown origin are preserved in translation in the Chinese canon. 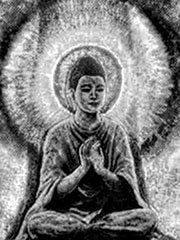 Traditionally, Buddhists have been of the belief that the Abhidharma was not a later addition to the tradition, but rather represented the first, original teachings of the Buddha. According to myth, shortly after his awakening the Buddha spent several days in meditation, during which he formulated the Abhidharma. Later, he traveled to the heavenly realm and taught the Abhidharma to the divine beings that dwelled there, including his deceased mother Mahamaya. The contents of the teachings given in the heavenly realm were related to the monk Shariputra, who passed them on after the Buddha’s death. The Abhidharma thus represents a pure and undiluted form of the teaching that was felt to be too difficult for most practitioners of the Buddha’s time to grasp. Instead, the Buddha taught by the method related in the various sutras, giving appropriate, immediately applicable teachings as each situation arose, rather than attempting to set forth the Abhidharma in their complexity and completion. Dhamma Sangani (‘Enumeration of Factors’) — Describes the fundamental phenomena or dhamma which constitute human experience. Vibhanga (‘Analysis’) — An exposition of the analysis in the Dhamma Sangani in the form of a catechism. Katha Vatthu (‘Points ofControversy’) — A collection of orthodox answers to questions about monastic practice, compiled by Moggaliputta Tissa after the Buddhist Council sponsored by King Ashoka in the 3rd Century BCE. Puggala Pannatti (‘Descriptions of Individuals’) — An enumeration of the qualities of certain different ‘personality types’. These types were believed to be useful in formulating teachings that an individual would respond to positively. Dhatu Katha (‘Discussion of Elements’) — Similar content to the Vibhanga, formulated as sets of questions and answers. Yamaka (‘The Pairs’) — A repetition of much of the contents of the Vibhanga, Dhatu Katha, and Katha Vatthu. These have all been published in romanized Pali by the Pali Text Society, and have been translated into English as well. Scholars date these works from about 400 BC to about 250 BC, the first being the oldest and the third the latest of the seven. Additional post-canonical texts were composed in the following centuries which attempted to further clarify the analysis presented in the Abhidhamma texts. The best known such texts are the Visuddhimagga of Buddhaghosa and the Abhidhammāvatāra of Buddhadatta. Early Western translators of the Pāli canon found the Abhidhamma Pitaka to be the least interesting of the three sections of the Tipitaka, and as a result this important aspect of Buddhist philosophy was little studied in the West until the later half of the 20th Century. Caroline Rhys Davids, a Pāli scholar and the wife of Pali Text Society founder T.W. Rhys Davids, famously described the ten chapters of the Yamaka as «ten valleys of dry bones». Interest in the Abhidhamma has grown in the West as better scholarship on Buddhist philosophy has gradually revealed more information about its origins and significance. Within the Theravada tradition, the prominence of the Abhidhamma has varied considerably from country to country, with mainland Southeast Asia placing the least emphasis on the study of the Abhidhamma and Sri Lanka the most. The Sarvastivada Abhidharma also consists of seven texts. However, comparison of the content of the Sarvastivada texts with that of the Theravada Abhidhamma reveals that it is unlikely that this indicates that one textual tradition originated from the other. In particular, the Theravada Abhidharma contains two texts (the Katha Vatthu and Puggala Pannatti) that seem entirely out of place in an Abhidharma collection; the reason for their conclusion, and the resulting parity in number of Theravada and Sarvastivada texts is a matter for conjecture unlikely to be resolved. «On the Abhidhamma books of the Sarvastivadins», by Professor Takakusu, in Journal of the Pali Text Society, 1905. Collett Cox, Abhidhamma in Encyclopedia of Buddhism, Robert E. Buswell, Ed., McMillan USA, New York, NY, 2004. ISBN 0028659104.